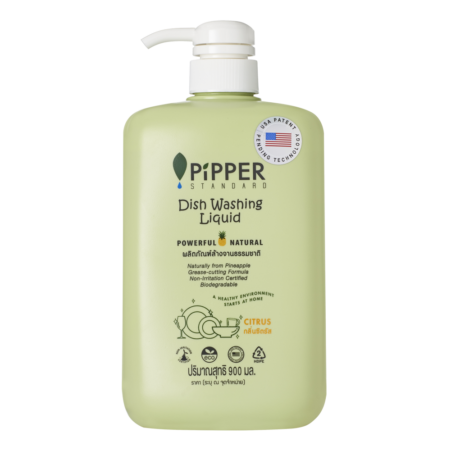 PiPPER STANDARD dish washing liquid harnesses natural pineapple enzymes and organic acids to cut through grease, grime, and food debris for a sparkling, natural clean with no streaking or spotting. It is non-irritation certified by Dermscan Asia and is free of any known allergens, meaning it won’t dry out your hands or make them itchy or stripped. PiPPER STANDARD dish washing liquid is safe to use on plastic, metal, melamine, porcelain, glass, ceramic, crystal and most other dish types, including baby bottles and utensils. Natural and safe, PiPPER STANDARD dishwashing liquid can also be used to clean fruits and vegetables. How to use: Pump a small amount onto a sponge or directly into water. The amount of dish washing liquid necessary depends on the number of dishes and grease level. Ingredients: Deionised water, fermented fruit fluid, alkyl poly glycoside, sodium citrate, sodium lauryl sulfate (plant-based), glycerin, sodium polyaspartate, natural essential oil and preservative (natural food grade).